In 1976, Joseph Bathanti left his home in Pittsburgh for a fourteen- month sojourn as a VISTA Volunteer with the North Carolina Department of Correction. His new volume of poems, CONCERTINA, recounts in lyrical sweep his entry into the surreal, brutal, and often terrifyingly beautiful netherworld of convicts and their keepers. It is a world with one foot still firmly planted in the old chain gang, the other venturing beyond the manacles of history into a realm of second chances, while the country, in the throes of its bicentennial celebration, still swoons from Watergate and its aftermath. What’s more, CONCERTINA, is an outsider’s meditation on the American South and the power of place to transform not only language, but to instill in the speaker the impulse to tell the story of everything his eye lights upon. Indeed, Bathanti’s world is as much about the geography, the very ether, of North Carolina, as it is about prisons. His voice is contemplative, poised on a tightrope of its own making, pitched near detonation. There are poems about the gas chamber, bounty hunters, bloodhounds and violence. But there are also poems about yard basketball games, the prison kitchen, Christmas parties, children visiting their imprisoned mothers, guards as undone by their lives in prison as the prisoners, and released convicts stumbling into society after years behind bars. Even Raskolnikov makes a cameo. All the while, the speaker is falling in love with another VISTA, a woman from Georgia. Above all, these poems doggedly insist that, even in abject suffering, sustained love and shared humanity supply redemption. Formally, these fine new poems by Joseph Bathanti can most accurately be described using a critical term invented by Norman Dubie, which he called the lyrical narrative, a formal gesture that has as its core a desire to take advantage of those two distinct styles and thus forge a new way to tell stories. The poet’s experiences working behind bars with prisoners and his surprising insights into their lives, inform these poems with a powerful authority of voice that is never hesitant to be raucous and wide-ranging in order to bring us closer to a world the rest of us know little about. We should be grateful too for the places these poems deliver us because we are made more aware of just what it most fully means to be human by these visitations. This is the poetry that sustains us and that makes us better. 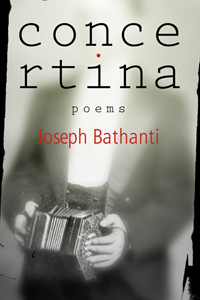 Joseph’s Bathanti’s title, CONCERTINA, makes the connection between the musical instrument and the barbed wire used around prison walls to snare escaping prisoners. In these beautifully lyrical poems, he chronicles his journey into manhood. In 1976, when it was still “safe to be poor and dirty and radical,” he leaves the confines of his parents’ home—an exodus that fills him with the exuberance of an escape(!) —and takes a yearlong job as a volunteer VISTA worker in a prison in North Carolina. It is a year of initiation into the unexpected joys and sorrows of the world. He shows us— not the prisoners we read about in newspapers or see on TV—but human-sized: the small and large ways they struggle and triumph. No matter what pressure is exerted on the soul, what forces are set against it, we see it in flashes of desire. Describing a prisoner’s jump shot: “his leap: / an exaggeration in the rafters, / all sky, then whooom: / two more for the bad guys.” In a place designed to take away choice, there is choice. Bathanti goes back to the prison 36 years later and it’s gone, its “remorseless efficiency shrunken.” It takes many years to write an experience that you have lived so deeply. CONCERTINA contains the lessons, not only of Bathanti’s year working in the prison, but also of the man who began to live there, the opening of the heart, and the lifetime from which he looks back with such compassionate perspective. Without his witness this moment would have disappeared. This is an act of gratitude, and one of the most moving books that you will ever read.